In the first article we introduced the concept of the hybrid approach. In the second we identified some benchmarks to give an indication of benefits. In this article we are going to bring the benefits and the adoption plan together with some assumed costs. This business case is fictional. It is based on a real world scenario but all of the numbers are purely hypothetical. The fictitious business spend $2 billion and receives 250,000 invoices each year. There are some assumed costs of software. Great care should be taken NOT to use these costs as an indication of anything that may apply to a real world situation. For some organisations, actual costs could be much higher or indeed much lower. From the approach and the benchmarks described in the previous two articles, we have an adoption plan and we have some benchmark savings. This means that we know what savings we can expect and when to expect them to crystallize. Take Year 1, Q3 as an example. According to the adoption plan, 30% of invoices will enter the finance system through OCR and intelligent data capture and 30% will be electronic invoices. 40% of invoices will still be manually input. 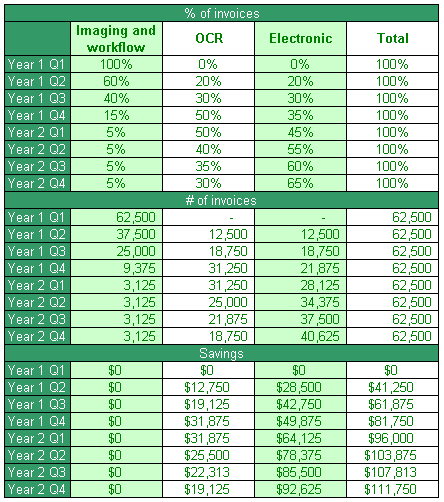 The benchmarks suggest that there is a saving of $2.28 for every invoice we receive electronically and a more modest saving of $1.02 for the OCR invoices. 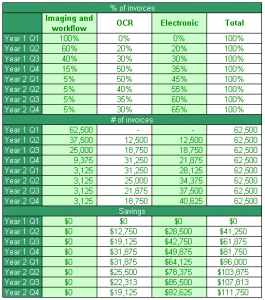 Therefore, for Year 1, Q3, there will be 18,750 OCR invoices delivering a saving of $19, 125 in that quarter. Similarly, the saving derived from the e-invoices in that quarter will amount to $42, 750. A total sdaving of $61,875. 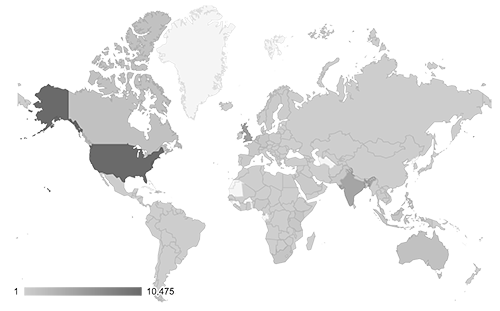 The estimated savings for each quarter over a 3 year period are described in the electronic invoicing adoption plan table. Pulling together the costs and benefits gives the summary business case. The cash flow, the difference between the benefits and the cost, and in particular the cumulative cash flow gives us the point at which we get a return on investment – i.e. when the benefits have exceeded the costs. The numbers are a bit dry and this business case is best looked at graphically. 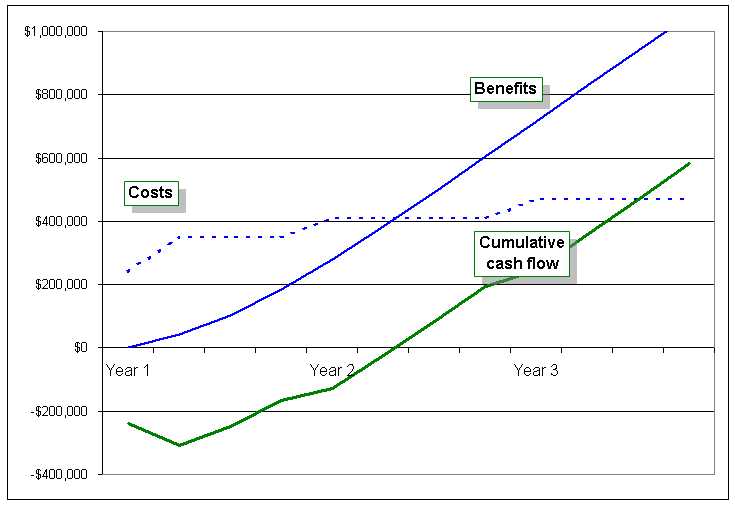 The chart illustrates how the a return on investment is achieved after about 18 month. This is generally acceptable and with a total profit of about $600K in 3 years, this is a fairly compelling business case. The internal rate of return on this project is 46%. But before you get too excited about the compelling nature of this business case you need to understand something very important – it gets better. And that’s the subject of the fourth and final article in this series – e-invoicing business case – the icing on the cake.